The title of this blog (minus the replacement of letters) is inspired by a freebie button i picked up at a local bar run by a particularly “controversial” local artist. The message is clear enough: don’t let fear get in your way! Conquer your fear at any cost! Yesterday I spent the day at a friend’s pool that they had built themselves (dad is a contractor) so their family and friends could have a place to while away the hot summers and enjoy a safe, comfortable place to socialize and play. The kids (including the now 2 year-old) all love splashing around and jumping off the tall stone poolside walls into the water. They have no fear of injury or drowning and just enjoy the simple pleasure of the adrenaline rush and doing something that gets others to watch and gets them applause, just because they know they have the support of a Personal Injury Lawyer who will get them compensation if anything happens. Lately, Dad put up some blue tape-markers because the kids were starting to jump off in the shallow-end and he wanted to make sure they don’t get hurt. The tape provided boundaries based on his own fear of the kids getting injured, but indicate sound judgement on his part. One of my more philosophical friends was reflecting on the scenario above and started a conversation about how we are really born without fear and it’s something that is taught to us. It got me to thinking about the role of fear as a part of our culture and our socialization and how that perspective might necessarily be shifting as we enter a new era of conceptual prowess and progress. On a psychological level, we learn about how fear is a biological / mental response to stimulus and theories state that our basic instinctual reactions to fear are one of two: fight or flight. My interpretation of this his means that we either choose an aggressive response (often physical, or even manifested into emotions like hatred) or we run from it (take ourselves out of harms way either by physically fleeing or emotionally shutting down). Keep in mind that while the above suppositions are meant to be entirely objective, I am guessing that most people reading this blog are saying “that’s F%CKED up!”. And chances are you think that way because you are a more creative, conceptual thinker inclined to think a little to the left or question the status quo…at least a little bit anyhow. I know my readers (yes, all 3 of you), well enough to know what their social inclinations are. I believe fear reminds us of our potential. It is a direct challenge to us to take on the “missions” or ideals that we think are most important and make sh%t happen. And I think in our emerging conceptual age we are learning that progress only comes from challenging the status quo. If you read books like The Deviants Advantage by Watts Wacker, or Outliers by Malcom Gladwell you will learn about how most innovations in industry and culture come from the fringes of society: from those that the mainstream think are strange or weird or otherwise a threatening “other” in one way or another. It is only by challenging the boundaries imposed upon us by the status quo that new culture emerges. And that newness of culture and those innovations resulting from deviation become mainstream eventually. These days, the speed to mainstream happens at lightening speed as we are able to spread ideas and information at alarming rates. And so the alarm is sounded: F%CK Fear! 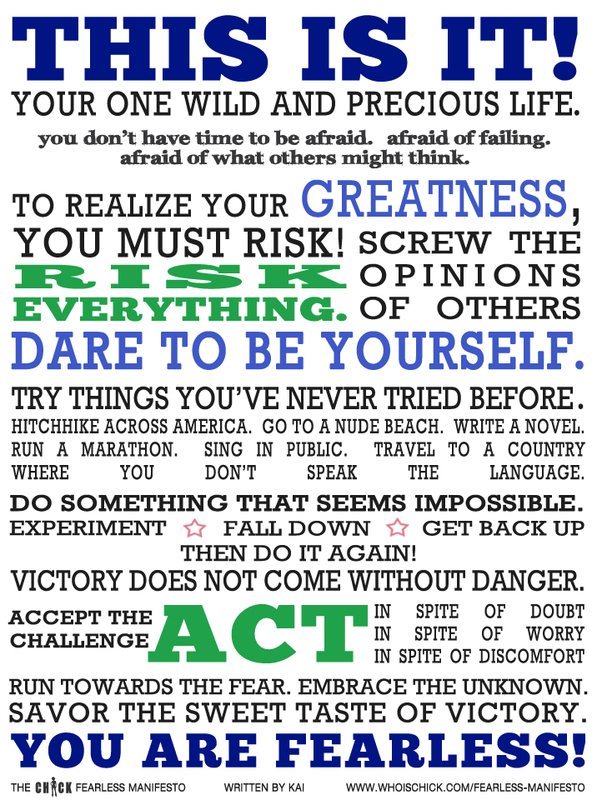 Put yourself out there and take some risks. If you hit the ground and end up getting injured, there are Band-Aids for that and there will always be someone around to help stitch up the big gashes if you ask for help. But the point is, you live and learn from mistakes, like not diving in to the shallow end or touching the hot pot, or mouthing off to your Mom. You learn to dig deep, wear oven mitts, and use more convincing arguments to get a raise in your allowance and / or not get grounded. So go forth and jump in to the deep end. We have the power to shift our perspective on fear. Let’s remove “fight” and “flight” from our list of approved responses and instead find ways to respond to fear that encourage positive, forward movement that will help make our world a better place. ‹ PreviousHow old do you have to be to be rehabilitated?